Using plain PHP files as template is a big temptation. They’re easy to implement and fast. But you need to take care of security issues. For example if you work together with designers, using a template engine is a good solution. It sandboxes our templates and separates the business logic from the HTML. With plain PHP files is very easy to put business logic within templates. Haanga really rocks again. The performance is very similar than plain PHP templating. Plain PHP is obviously the fastest but Haanga is almost the same. It’s a pity the lack of complete documentation (it’s very hard look into the source code to find features and examples). As Cesar Rodas (Haanga’s developer) told us in a comment Haanga generates self-contained PHP code. Because of that the performance is close to plain PHP execution. Another useful links about it here and here. It’s probably the most famous template engine. It’s a mature project. For years it was “the” template engine and the others were the “alternatives”. It was famous because of the speed. It’s another new template engine using the Django style. It was developed for Menéame by César Rodas. With this test I use the same php file, changing template name from indexFull to index. Haanga really rocks in the test. It’s the fastest in all cases and it’s the best using memory. The main problem I’ve seen with Haanga is the lack of documentation. When I wanted to use the cycle filter (to create the zebra style in the HTML table) I didn’t find anything about it. I had to browse the source code and finally I found it in one tests. Whereas Smarty documentation is brilliant and Twig is good enough. The HTML template syntax is almost the same with Twig and Haanga (in fact both of them are Django style). Smarty is a bit different but is very similar. The PHP part in Smarty looks like a bit old fashioned compared with Haanga and Twig, but it’s really easy to use. The performance of Twig and Smarty are similar. Twig is slightly better. But with simple templates i’ts almost the same. There are many standard options. Why I prefer a different one then? I like plain PHP classes because the IDE helps me with autocompletion. The usage is quite simple. Instead of using parse_ini_file function we only need to include our configuration class within our project. And that’s all. Maybe the worse part of this technique is if our application writes the configuration file (a typical installer.php). In this case we need to build the PHP’s class file and it’s slightly more complicated than writing a simple ini file. What do you think about it? Do you use another different way? 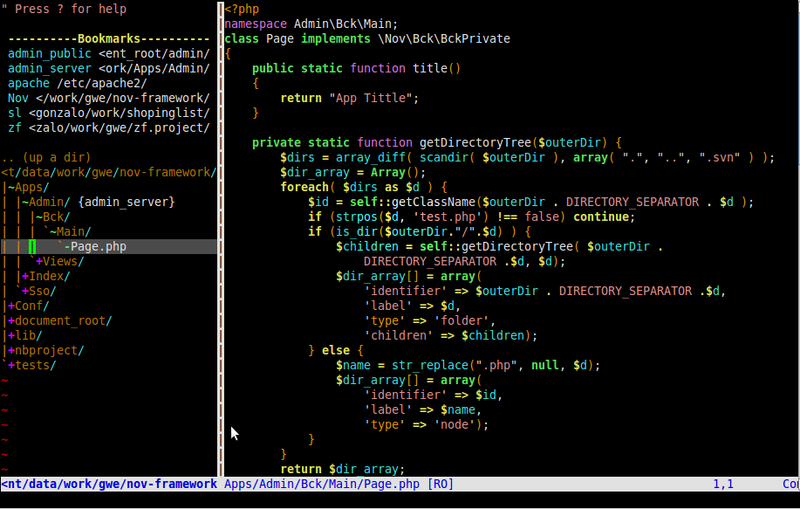 My VIM configuration for PHP development. Great plug-in. Allows to explore filesystem. It’s easy and fast. I use F5 to toogle the NerdTree We move across the filesystem (jk) and open files with “o”. It’s really intuitive. Another great feature of NerdTree are the bookmarks. We select a folder and we type :Bookmark and we easily create a bookmark. Really cool when we work with different projects. 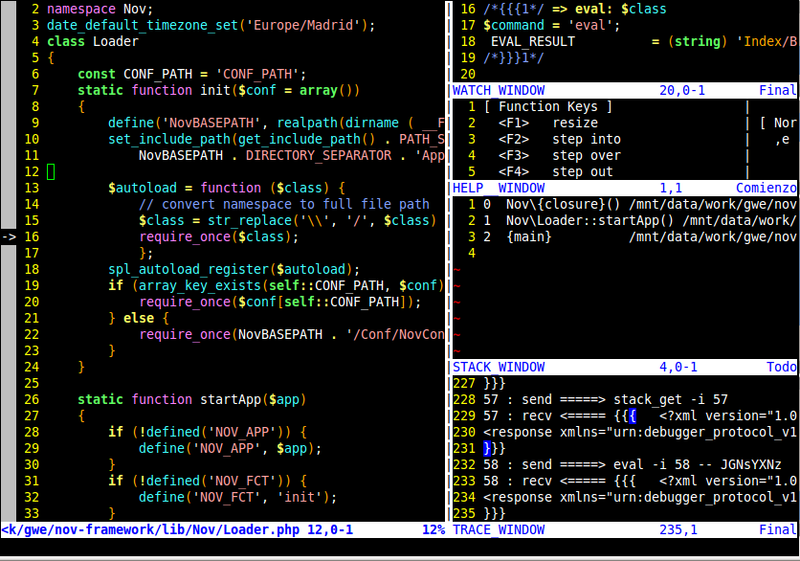 We can manage vim’s buffers with standard vim commands(:ls) but I like to use this extension. I’ve mapped BufferExplorer with ç key. I use a spanish keyboard and ç key is a letter I never use and is easily accessible, even for my small hands. When I type ç I can switch between my buffers. We need xdebug plugin installed on our server. I’ve changed the original keys for this plugin because it uses NerdTree ones. I use control + the original keys. For example control + F5 starts the debuger and waits for the debug session from the browser. Xdebug helper for google chrome works fine.